In this podcast, Vidhya Alakeson, Chief Executive of Power to Change, the independent trust supporting community businesses in England, explores some of the ways local people have taken local power by running community businesses, and the many benefits that brings. Featuring community businesses from Bristol, Luton, Liverpool, London, Leeds, and Wellingborough. Community empowerment as a solution has fallen firmly out of fashion in government, scarred by the emptiness of the Big Society agenda and its arrival on the coat tails of austerity. The community rights legislation, ushered in under the Localism Act 2011, is now rarely mentioned, and the initial drive to push power as far down as possible has stalled. That is not to say nothing has changed. Despite the lack of attention, enlightened councils see community empowerment as ‘best practice’. In Luton, for example, the council had previously struggled with vandalism around public spaces – costing it time and money. But when it worked with local residents to build a pop-up park as part of the Arches Big Local project, those same residents were quick to address any damage to the asset they had helped bring to life. In the face of vandalism, the community fixed the fence before the Council had even arrived to inspect it. Sadly, this kind of collaboration with communities still doesn’t happen routinely. “It is these kind of communities we need to be much, much better at supporting. Above all else they must be listened to. They must be heard. It must be an honest and open discussion across all communities. Where consultation isn’t just treated as a legal necessity, but a genuine engagement in which all views – even ones we don’t like – are treated as if they could actually be right. Where we value voices, dissenting or otherwise”. What the dark example of Grenfell shows is that too often still communities are not even listened to, let alone given any power to make a change. So while we can be proud that real progress has been made to replace the hollow consultation processes of old, we need to go much further if we are to tackle some of the toughest economic and social challenges the country faces. But what can communities really do? Community control can achieve great things. For example, giving communities genuine power can help tackle the decline in local economies. We are all too familiar with the data: inequality between the north and south of the country is growing; the economic vibrancy of cities is uneven across neighbourhoods; and outlying areas often do not feel the benefits. In places up and down the country, fortunes have remained bleak since the decline of industry over 30 years ago. The financial crisis, recession, austerity and the slow recovery of wages and household incomes have only served to compound the problem. And the result has been anger and frustration in communities which feel left behind. This was all too evident in the EU referendum. Patterns of voting closely reflected patterns of economic opportunity. Devolution has been presented as part of the solution. But it does not go far enough to ameliorate these trends. The devolution of power from Whitehall and Westminster to nine city regions, and their extensive plans for investment rarely take account of the concerns and needs of ordinary people in towns and villages, or in the more deprived parts of core cities. To really start to address the frustrations of those who have lost out, we need to address inequality at the level that it affects people every day. And to do this, we need to drive power downwards to communities. There are many examples where communities are taking the lead to solve their economic problems and tackle economic inequality at a local level. In particular, where communities have been able to take ownership of assets they are able to use the scope for revenue generation to confront local economic challenges. Bristol Energy Cooperative, for example, at one time the biggest community energy company in the UK, projects that it will contribute £4 million to benefit the communities of Greater Bristol and Somerset over the next 25 years. This is community business at its largest scale, but other assets – from shops and pubs to libraries and leisure centres – can provide small surpluses at the same time as providing valuable services and supporting jobs. More than this, there is also good evidence that community-led models can thrive where private businesses have struggled or would not venture. Community-led housing organisations, for example, will take on land that private developers would not entertain. Where a plot size is too small or requires too much remediation to be financially viable in a traditional business model, communities can draw in a wider range of types of capital, including investment from local people who back the business. Leeds Community Homes, for example, raised £362,000 in 2016 through a community share offer to support the construction of its first 16 affordable homes. Two thirds of investors were from Leeds; a substantial proportion from the more affluent parts, who were more interested in backing a local initiative to improve their city than they were in personal benefit. Likewise, hundreds of community shops are helping small villages—they have an impressive five year survival rate of over 95% compared to around 50% for small businesses generally. In a small village community, a single asset like a community shop can create significant impact. Indeed, it can be the biggest single employer in that area. In larger urban areas, an ecosystem of assets and community businesses will be needed to start to change the community’s view of its economic future. Alt Valley Community Trust in North Liverpool has achieved such a change. It is a community group with deep roots in the area stretching back over 30 years, has a turnover of £2.5 million, and employs 70 people. Its roots are in education and training, but over time it has taken over running a number of services and facilities from the local authority, including libraries, leisure centres and even a working farm. 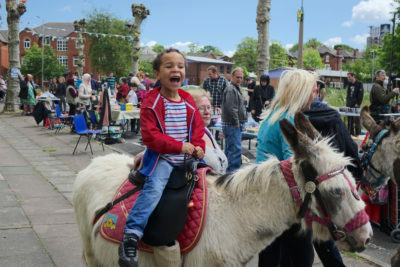 Research conducted for JRF in 2010 identified the community leadership of Alt Valley Community Trust as ‘significant’ in the regeneration of North Liverpool. But it is not just that community-led organisations can do the things that local authorities can do, it is that they can often do them better. Like economic inequality, the challenges facing public services, particularly at local level, are well documented and well understood. Fifty percent cuts to local authority budgets since 2010 have left local authorities with limited capacity to continue many of the services that previously provided a network of local support. Children’s centres, youth services, information and advice services, leisure facilities and more have been stripped back. Even statutory services are struggling. A report by Action for Children highlighted 140,000 children who are not receiving local authority support because they do not meet the ever-harder-to-reach thresholds for access to help. Communities, particularly in disadvantaged areas, are bearing the brunt of this loss. But they can also offer solutions. Community ownership of public services is about much more than local people simply plugging gaps left by the state. It is about improving the delivery of public services by doing things differently. New Wortley Community Centre in Leeds offers a promising example of how community control can significantly improve public service delivery. Its work with people coming out of prison is led by a local ex-offender, and its results have been attracting national attention. Only two of the 80 ex-offenders helped by New Wortley have found themselves back in prison, compared with a reoffending rate in West Yorkshire of 34 per cent. The real difference lies in the inclusive atmosphere at the centre: it is non-judgmental, and there is no stigma attached to someone recently released from jail. In turn, this reflects the community where the Centre is based: on the New Wortley estate everyone knows someone who has been in prison; and they understand why and how to help. The centre offers a community space for ex-offenders to find their feet with support from a team of local people who want the same outcome. Equally, at Glamis Hall – a community-owned centre offering respite for older people with dementia, Parkinsons and other conditions – outcomes have been transformed by reimagining service delivery from a place-based perspective. Staff there saw the flaws in the local NHS system. The centre was racking up taxi bills helping older visitors get to GP appointments, while GPs were wasting time and money through missed appointments. So they arranged for doctors and nurses to do their health checks at the centre. The professionals now come to where the older people feel at ease. The service is fitted around people, and not the other way around. And it saves people money: by reaching so many people in a single venue, a podiatrist visit costs £15 at Glamis Hall compared to £30 for a home call. Both New Wortley and Glamis Hall show what can be achieved when you combine the strengths of community connection and informal support with more structured formal interventions. Among other things, this can reduce the cost of services by maximizing the communities’ capacity for mutual aid, recognising that social connections are vital for well being. The connectedness point is critical. In recent years, insecurity has become a growing feature of many ordinary people’s lives. The slow pace of recovery in wages and household incomes, coupled with significant cuts to working age benefits and the growth of insecure employment, have eroded people’s sense of security and control. At the same time, austerity has hastened the demise of civic institutions, particularly at the local level, as local authorities have withdrawn support from civic spaces where people traditionally came together. Community centres, parks and street markets have been closed or had access restricted, and we have been left with a vacuum, locally and nationally. Out of this vacuum some new ideas are emerging to enable people to find a collective voice and take collective action. At the local level, community-owned organisations have a critical role to play in allowing local people to come together to create positive change, find a voice and develop a sense of belonging. As well as providing physical space for communities to meet, community-owned organisations can galvanise local people, giving them the confidence to take action that they might lack if acting alone. This can be seen powerfully in the experience of residents of the Granby Four Streets area of Liverpool. Following the Toxteth riots in the 1980s, the Granby Four Streets area of the city was left to decay. The council planned to raze the area to the ground and most people moved out. But 30 or so residents stayed and together resisted the decline of the area they called home. Their resistance started small: tidying up the streets to emphasise that people still lived there; putting large planters on the pavements filled with flowers to bring back life to the abandoned streets; and painting the boarded-up houses. Through this collective action, they started to develop their own vision for the future of their streets. Eventually their resistance bore fruit and the council invited them to the table to help shape plans for the future of their area. As part of this, they were offered the opportunity to take ownership of ten of the derelict properties from the council and use them as the foundation for a community land trust that would give the community a permanent stake in the future of the area. This last part is crucial: residents weren’t just given a say over their own community but control of it. Today, Granby Four Streets Community Land Trust continues to offer local people a way to come together to take action about the things that matter most, while also generating revenue to benefit local people through the development of affordable homes. What all of these examples demonstrate is that it is essential that communities have not just a say but a stake in their futures. The factor underpinning the effectiveness of the solutions, whether in Luton, Liverpool or Leeds, is that the organisations are not just alternative, voluntary sector providers of services. They are organisations rooted in and run by their communities. Most of their staff are local and local people visit them, not to receive a service as a customer, but to have a hot meal, have a chat, get some help from others with whom they feel they share a connection. In other words, it is explicitly, the community ownership and leadership that make the decisive difference. Recent research for Power to Change looking at mental health services found evidence that “community-centred approaches that work with the grain of local people and their needs have a positive impact”. In contrast, community-based approaches in which existing, often professionally-led, initiatives are transferred to the community did not. Similarly, in the past, economic regeneration initiatives invested billions in deprived communities. But this didn’t pay enough attention to the critical factors that make investment stick for the long term. First, it didn’t do enough to build the capacity of local people to take ownership of local change and be the leaders of it for the long term, and second it didn’t invest enough in asset ownership and enterprise to allow communities to continue to generate income after the initial investment had gone. Because what defines the ‘community stake’ in all of the examples given is the ownership of assets. And that is because, ultimately, ownership equals power. Let’s be clear: community ownership and control does not mean professional expertise and experience has no value. Communities need the skills and advice of planners, surveyors, architects, lawyers and a host of others to turn their vision into reality. But more than this, it recognises that the community has expertise too. In the traditional sense, those who are deeply involved in any form of citizen governance are often professionals with huge experience that can often outweigh that of local authority officers or drafted-in consultants. But in another sense too, communities have untapped expertise – they often understand the issues more deeply, have a more instinctive sense of what will work, can identify potential hurdles from a mile away, and provide the impetus to ‘fix the fence’ in a fraction of the time. But the question of ownership is not just about who knows best, but also a question of who sets the rules. The ‘in vogue’ concepts of co-production and co-design recognise that individuals and communities are assets with skills and expertise that should be part of any solution rather than problems to be fixed by the state. But they have their limitations because, as was the case with consultation and participatory mechanisms before them, power still does not always transfer to the community: it often remains with professionals. Professionals tend to hoard power, be they local authority officers, health commissioners, medical professionals or job centre staff. Ownership, on the other hand, allows communities to set the rules, and invite in others to support them in realising their ambitions. They can tap into professional expertise, rather than allowing that professional expertise to dominate. The experience of Myatts Field Park Project illustrates this neatly. 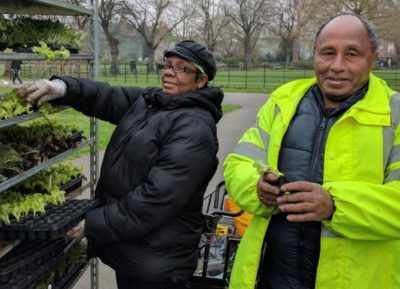 The community organisation had plans to refurbish a run-down building in the park to create a more welcoming, better-used community space for local people in South London. To secure independent finance for the project, the organisation required an extension of its lease from the local authority. Rather than extending the lease, the local authority offered to provide the finance itself and offered up its contractors to do the work. On the surface of it, the outcome is the same: the community ends up with a refurbished community space as it wanted. But throughout, the local authority was in charge of the timetable, not the community. This undermined the ‘stake’ of the community in the outcome. The community lost out in the deal. It didn’t get control. So how do we go about growing community ownership? Community action often starts small: a litter pick, a local street market, a community festival. These small steps are vital to build momentum and get local people to see that things can get better. But if we want to see lasting change in those communities which have fallen behind, if we want to tackle the major challenges of economic decline, social reform and civic renewal, we need to enable more community action to progress on to community-run enterprise and community ownership. It is through ownership and enterprise that we can support communities to address their needs and give them the tools with which to create long-term, sustainable solutions. First and foremost, the government should make increasing community ownership, particularly outside of core cities, a central objective of the next tranches of money available from unclaimed assets. In contrast to the creation of Big Society Capital, there should be less focus on the nature of financial products and a much stronger focus on the outcomes the funding is seeking to achieve. This would allow flexibility in how the money is used, rather than it being channeled towards one type of financial product or another. In addition, government should use the money it already invests in community ownership more smartly rather than being constrained by annual funding programmes. The £60 million that government is committing annually to community-led housing is a case in point. At the moment, the £60 million has to be spent in a single financial year. Instead, it could be used as an endowment to create a fund that would support community-led housing on a long term basis. Structured this way, the government’s contribution could also draw in significant amounts of funding from elsewhere, from aligned grant funders, for example, and from Big Society Capital which has identified community-led housing as a strategic priority. Using scarce government money in this way will have far greater impact and longevity. Aligned to this, major grant funders in the community space, including Power to Change, should come together to support community asset ownership in a coordinated way. There are already examples to build on, such as the collaboration between the Big Lottery Fund and Heritage Lottery Fund to support the Parks for People programme. Since 1996, this programme has awarded £850 million to maintain parks in urban areas. Collaboration on this scale will be required to significantly drive up community asset ownership. At the city region level, it is critical that larger scale strategic plans are connected with community-based activity, to ensure that high level investment can be channeled towards local areas. This thinking is developing in the West Yorkshire City Region where established community organisations are included as part of the overall economic strategy, and should be followed elsewhere. There is also an urgent need for greater representation of community-led organisations at city region level. It is inadequate that Local Enterprise Partnerships – which have already been allocated £18.5 billion – have very limited or no representation on their boards from the voluntary, community and social enterprise sector (VCSE). The VCSE sector is large and diverse and should be better represented, with specific representation from community-led organisations. Local authorities also have a critical role to play. Power to Change estimates that local authorities own as much as £7 billion of assets that they are no longer able to maintain or are superfluous to needs and could be transferred to communities. Local authorities have the mandate to transfer these to communities for less than market rate, if doing so will generate significant other benefits. But too few currently recognise the potential of asset transfer to accelerate wider goals around regeneration, economic development and social inclusion. Worse, some councils still actively stand in the way of community-led initiatives, hiding behind austerity to favour their own financial incentives over the good of their communities. As local authorities find themselves with less money to deliver services and shape local areas directly, they must embrace opportunities to enable local people to improve their own lives and neighbourhoods. There is, no doubt, a political consensus about the need to create a more inclusive economy and society. But the answers so far remain remote from the everyday lives of ordinary people. This is unsurprising. Governments generally look to big solutions that they can spread across the country, national programmes and standardised interventions. But regional industrial strategy, devolution to city regions and a national productivity investment fund just aren’t going to have the kind of impact on people on the ground that is needed to deliver the kind of inclusive economy and shared society that is often talked about, but which still feels very remote to most ordinary people in our towns and villages. Enterprise and community ownership of assets must be at the heart of devolution to communities to address this inequality. What we need is a revolution in community ownership that allows local people to address the challenges they face by drawing on the assets they have in their communities. Assets provide a base from which communities can generate revenue while enterprise provides long-term income for a community that they can control. As the RSA’s Inclusive Growth Commission concluded: ‘the key shift we need is from an economic model based on growing now and distributing later to one that sees growth and social reform as two sides of the same coin’. Community ownership enables local growth through social reform: tackling the decline of local economies; delivering high quality public services in the face of dwindling budgets; and rebuilding collective voice and action to address deepening insecurity. Government, at all levels, can enable this revolution by creating the foundations from which community ownership in Britain can thrive. But it must not lead. It must learn, finally, to let go and let communities lead. An inclusive economy and society has to be built by local people from the bottom up.